Dine N’ Dash is a Real Treat! I attended my first Dine N’ Dash last year, which I promptly deemed trick or treating for foodies. The José Andrés’ annual summer culinary event benefits World Central Kitchen. Participants choose their starting venue, and travel through Penn Quarter and 14th Street, enjoying a staggering variety of dishes and drinks. It’s a challenge to see how many restaurants you can conquer- last year I managed to visit 12 out of 30. 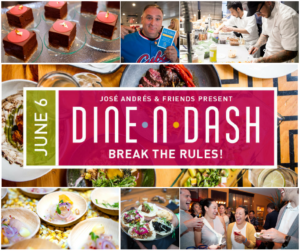 This year’s Dine N’ Dash takes place June 6, with a special emphasis on World Central Kitchen’s efforts in Puerto Rico. Thirty-five DC restaurants will participate. World Central Kitchen is a nonprofit of chefs creating smart solutions to hunger and poverty across the globe. Founded by Andrés in 2010, World Central Kitchen has paved the way among chefs for philanthropic endeavors first offering aid following the 7.0 magnitude earthquake that hit Haiti; and later in 2017, assisting in the aftermath of Hurricane Harvey in Texas, then immediately following with its largest relief effort to date, feeding over 3.5 million victims of Hurricane Maria in Puerto Rico. Since arriving to the devastated island in September , World Central Kitchen became the largest hot-meal emergency feeding operation on the island, with the help of dozens of chefs and over 20,000 volunteers under the #ChefsForPuertoRico movement. World Central Kitchen will be celebrating these efforts during the Puerto Rico House pop-up at the National Union Building (918 F St NW, Washington, DC 20004). The pop-up will feature cuisine from the #ChefsForPuertoRico [hashtag created to highlight this life-saving work] team, including Jose Enrique and Wilo Benet, live music, and other activations celebrating the generosity and resiliency of the people of Puerto Rico. Puerto Rico House located at ​National Union Building (918 F St NW, Washington, DC 20004). Guests may then dash to any of the 35 participating restaurants in the dine-worthy Penn Quarter and 14th Street neighborhoods for unlimited food and drink until last call. China Chilcano, Crimson Diner and Whiskey Bar, Cuba Libre, Daika, Flight Wine Bar, Jaleo, Momofuku CCDC, Oyamel, Pitango, Proof, SEI, Taco Bamba, Doi Moi, Colada Shop, B Too, Barcelone, Birch & Barley, Black Jack, Bresca, Cork, El Centro DC, Estadio, Ice Cream Jubilee, Lupo Verde, Masa 14, Sotto, Taqueria National, The Pig. Get your tickets, and then don some comfy shoes, so you really can dine and dash. Hope to see you there!